Well its almost the end of another year, sorry theres not been much news this year but hopefully we'll have lots more next year for you all to see. Runshaw Cadno and Runshaw Anwyled have now gone to their new homes and we wish their new families all the very best of luck , fun and success with them! Thank you both so much for giving them such fabulous homes and i look forward to watching their careers both in and out the ring with huge excitement! Well still not huge amount going on , quiet year this year thank god! The biggest news we have is that unlike our normal timescale we have actually weaned the 4 older foals from the mares this weekend!! Quite a feat for us as we normally get nearer to new year than October! But these foals are big and starting to pull their dams down so the decision was made and they are now weaned and tucking into their feeds with their Aunty Selina (Standwell Selina) and as usual i got far more worked up about it all than they did! We just have 4 colt foals left to sell from this years crop of foals and a yearling colt, please see our for sale page. We have 2 new additions in the form of 2 gorgeous Boxer Dog puppies!!! See the new boxers page for more details! Took Fosterhouses Supersam for his first time back in the ring since a yearling and he came 2nd ins a very strong stallion class, chuffed to bits with him as he was an absolute saint all day and went like a train bless him! And here he is looking all clean, sparkly and handsome! 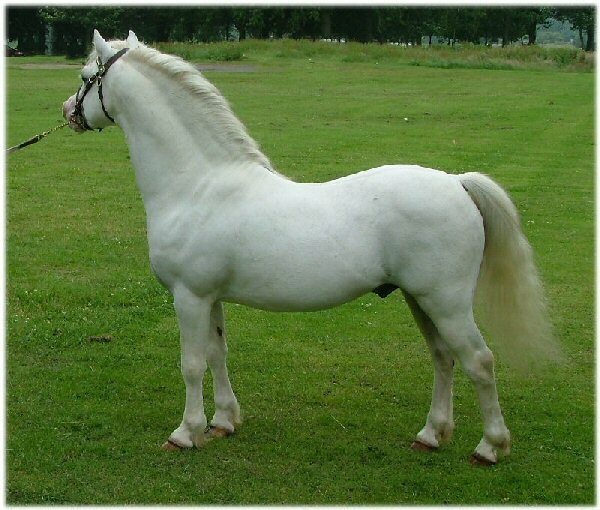 Churtoncroft Aries was first in a very strong stallion class with stallions a considerable amount younger than his 17 years! We thoroughly enjoyed ourselves and although didnt get anything in the championship we were more than happy to bow down to 2 fabulous mares in their prime, Idyllic Privalova , Champion and Silver medal winner and Idyllic Lady in Red in reserve, well done all. Pics to be added once copyright received. 29th May 2006 Well all the mares and foals have been out on the summer grazing for a week and are looking fantastic, foals are growing well and our thoughts now move to we really must get some of these maiden mares up and covered but we'll have to get Northern all Welsh medal Show out of the way first on Sunday, getting nervous!! 28th May 2006 The final foal of 2006 and what a stunner Brynrodyn Camellia has had!!!! Quality chestnut colt to Churtoncroft Aries named Runshaw Cadno, 4 long white stockings and a neat blaze! 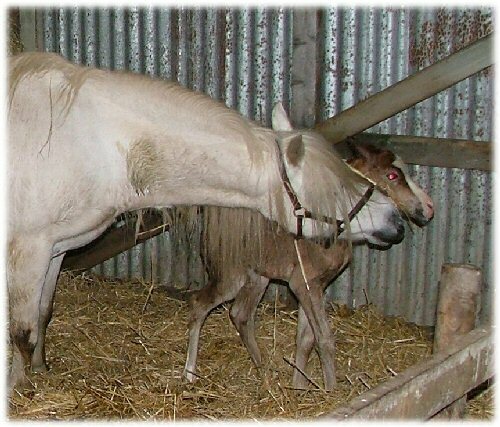 18th May 2006 Chetwynd Lily has had a beautiful Palomino colt today by Churtoncroft Aries named Runshaw Llewelyn , details on the foals 2006 page! Churtoncroft Hyfryd foaled at 1am!! Arrived safe and well at 1am precisely this morning and has now been named Runshaw Henadur. Anyway chestnut colt to go grey by Churtoncroft Aries and out of Churtoncroft Hyfryd. Its Hyfryds first foal and after the initial shock of this 'thing' in her stable under her nose that shook its head everytime she looked at it so looked away again she decided that once it was stood up it was actually one of those cute furry things like the mares in the next field have and she'll have that thank you very much LOL She stood like a rock for him to suckle and is completely obsessed by him and as a typical fella is revelling in it all People keep saying ooh but its a colt but i really don't care he is here fit and well his Mum loves him and its so lovely to watch her so devoted to her new toy! The mares Chetwynd Lily, Churtoncroft Hyfryd, Lacy Ruth, Cuheyln Anna and Brynrodyn Camellia are home now in preparation to start foaling from the end of May. All the foals are growing on well and enjoying the fabulous sunshine and growing green grass. Thats it for the first batch of foals now, so lots of sleep now until we start with the second batch due in a months time! 6th April 2006 Well after all my 'lecturing' Standwell Heidie had been listening all along and at 4.20am presented me with the most beautiful chestnut filly with 4 white socks and a blaze by Churtoncroft Aries just exactly as i had ordered! Pics will be added to the foal page later when she has dried out. This little lady has been named Runshaw Heulwen as it is hoped she is indeed my little ray of sunshine after the black cloud thats been with us lately! Thistledown Walnut has produced a fabulous big chestnut (will go grey) colt with 4 whites (just) and a big blaze, most importantly mother and baby doing well, pictures added to the foal page. Standwell Black Fashion has had a beautiful bay colt on the 31st March and both doing well, his details are on the foals 2006 page. March 2006 Penwisg Helen and Penwisg Sonnet are now home aswell in preparation for their foaling, getting quite exciting now. Sad news though is that we have lost our beloved Boxer, Helga, after a very short illness, she really was my dog of a lifetime and there will be a massive gap that she leaves behind but is now with her mum and we will cherish all the fabulous times we had with her. This lovely mare has finally arrived !! Massive thanks to the Grant family of Dorset for allowing me to have her and for the Cherrytop Stud for keeping her for me and bringing her up to Lancashire. This lovely little mare looks to be everything i hoped and dreamed of with her breeding and lovely temperament. Below is a picture of her taken 21st January while at Cherrytop. Details now added to the mares page! All of us here at Runshaw would like to wish you all a very happy and prosperous 2006! Not really much happening here at the minute although now the new year is here it certainly seems like spring is on its way and with it the hopeful arrival of happy healthy foals, the first of which is due at the end of March so please keep an eye on the foals 2006 page nearer the time. The ponies of course are all a year older and our wonderful old boy Coed Coch Barnwr has been wished a very happy 35th birthday and hopefully many more to come. And we hope to see a new arrival soon in the form of the beautiful Churtoncroft Seren Haf ( Coed Coch Llesol x Coed Coch Serena) a young mare who carries the same cherished dam line as our own Standwell Selina, Penwisg Sior and Churtoncroft Seren Del and sire lines of Churtoncroft Hyfryd. I have searched for some time to find Seren Haf and thanks to the wonderful power of the internet have now made contact with her and because of the huge genorousity of her owners is to come on lease to breed us a foal before returning home in foal in 2008 so we are very excited about the start to 2006! !